Is it too early for hot chocolate? The answer is who cares, hot chocolate is forever. OK, OK, OK...I know it's still summer. Hot, humid, sweaty, smelly, glorious summer — with temperatures sitting firmly planted near the triple digits. But I woke up last Saturday morning and needed hot chocolate. If I crave something, I make it, and eat it (or drink it in this case). It.Just.Has.To.Happen. Here is how mom taught me to make hot chocolate: heat some milk in a saucepan, add a bit of cocoa and sugar and whisk. Whisk for dear life. But no matter how much I whisk, lumps form every single time. Try again. This time sifting cocoa and whisking slowly. Heat mixture until warm and drink merrily, all the while trying to ignore the floating islands of partially stirred cocoa that dissolve in my mouth in unpleasant lumps of powder. But then came this thing called the caveman diet, and I learned that you can use coconut milk as a dairy-free option and get a great, creamy texture. I also learned that dark chocolate is not only OK to eat, but it’s the king of Paleo indulgences. When you combine the richness of coconut milk with dark chocolate you’re in for a really good, and really decadent hot chocolate with no lumps. Say what? 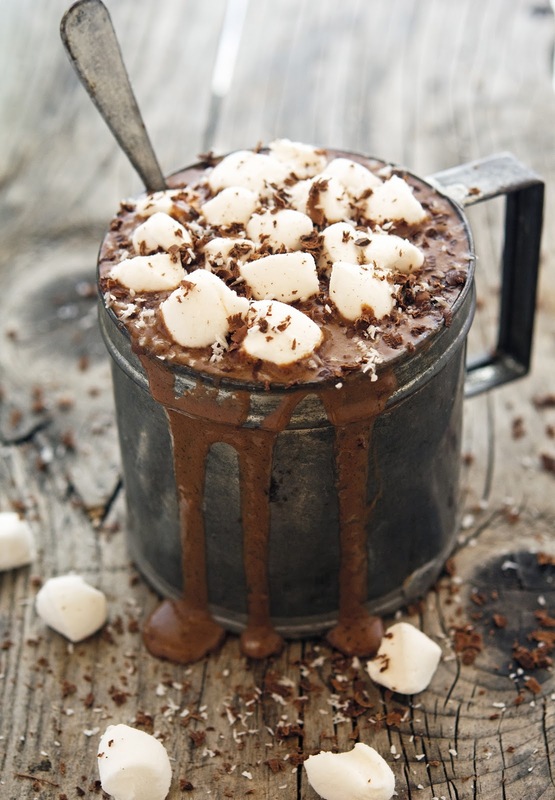 This (Paleo) Rich ‘n Creamy Hot Chocolate is so indulgent a little cup goes a long way. It’s also a breeze to make and you can think of it as a blank canvas. 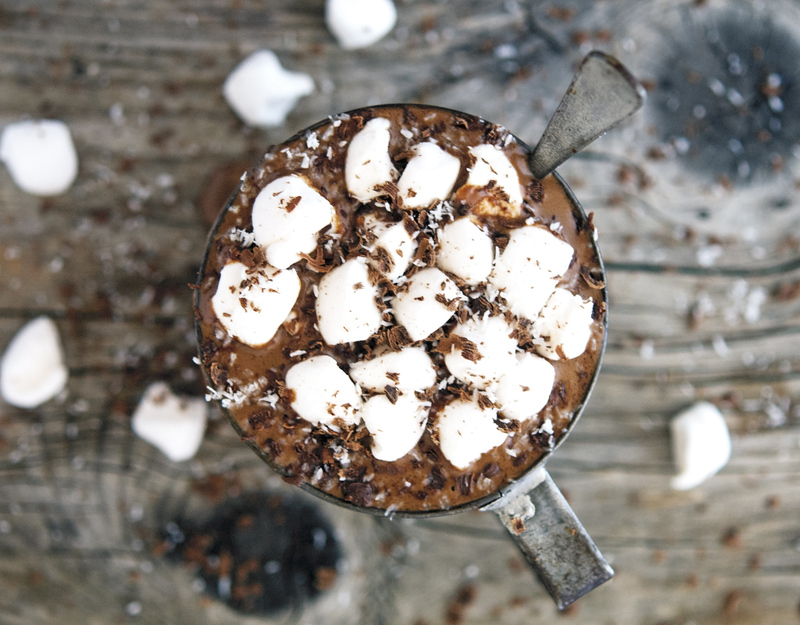 Add more chocolate if you like it extra chocolaty, or a couple of drops peppermint extract for a peppermint hot chocolate, some pumpkin spice for a pumpkin spice hot chocolate, and similarly for cinnamon. It’s full of good fats from the coconut milk and antioxidants from the high-quality dark chocolate - for once you can have hot chocolate and not feel guilty about it. And then, well, I probably should pretend this heaping pile of mini marshmallows was for 7-year old Niece. Because only 7-year old Niece would so shamelessly use a cup of rich and creamy hot chocolate as a vehicle for marshmallow consumption, right? The truth is I also made homemade (paleo) marshmallow and I couldn’t wait to show ‘em to you. 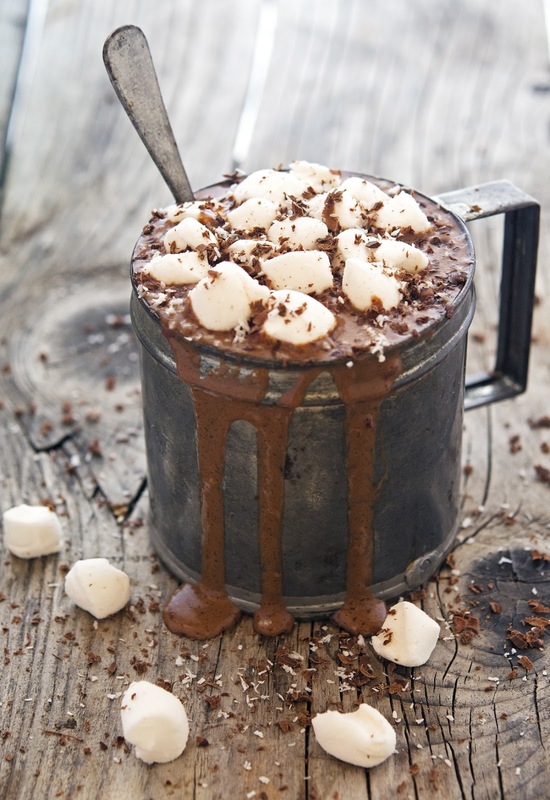 (Paleo) Rich ‘n Creamy Hot Chocolate Print this recipe! 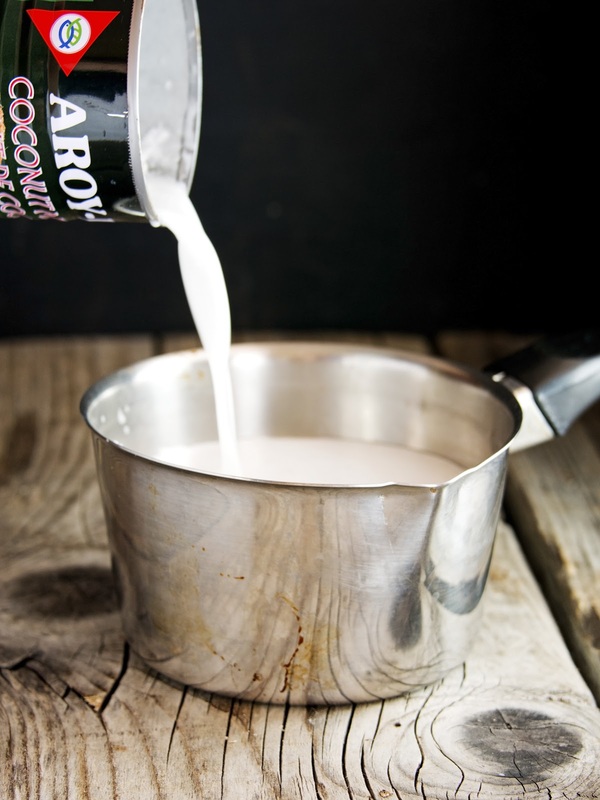 In a saucepan over medium heat the coconut milk until it starts to simmer, don't let it boil though. Simmer on low for about 8 to 10 minutes until it starts to thicken. Add in the chocolate, vanilla extract, and salt, and stir until fully melted. One serving yields 214 calories, 21 grams of fat, 8 grams of carbs, and 2 grams of protein. Never ever is it too early for hot chocolate, Mike! Besides, you can always chill it, right? :) But I would have never thought of using coconut milk, and this sounds fantastic! You've got really stunning pictures too. Is it appropriate to say I'd love to lick this mug? Don't answer, though. I know it's not. And don't you need a dishwasher by any chance? I'll promise do my best (especially cleaning the mugs after hot chocolate). Hahahaha man, you're a riot! I just love your version of coconut milk. I can have this any time of the year. Sounds amazing and look at that sinfully yummy mug. Awesome. Hope you had a good time on your vacay. Coconut milk is the best in hot chocolate. seriously! so this is bullet proof hot cocoa? haha just kidding. ALthough now you're on to something. Maybe add butter next time? NEVER too early,, especially when it's made like this. Pretty legit, Mike. Thick, creamy and chocolatey goodness right there AND homemade marshmallows... you kill me. I'm telling you Kev homemade marshmallows are da bomb, DA BOMB! The best diet I ever tried is Paleo. Lost weight, and feel much better and healthier. The mug, it's all about the mug! YESSSS "hot chocolate is forever"!!!! 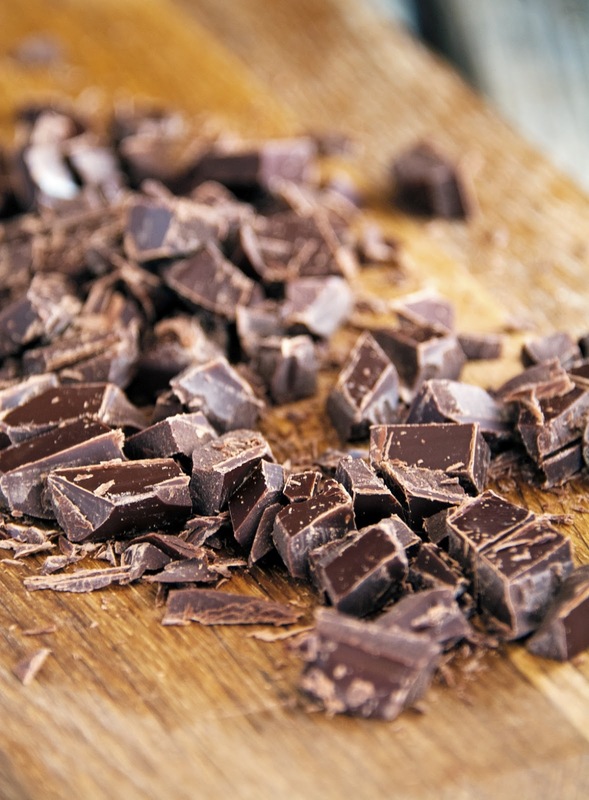 Actually anything with dark chocolate and coconut milk has to be forever - right?! Mike - this is fantastic! I just have so much love for coconut milk+dark chocolate! And those paleo marshmallows??? FABULOUS!!! I saw this on IG yesterday - dang dude - where'd you get that cup? It's GORGEOUS!!! I hope that one day you do a post on your food props - simiar to the one you did on kitchen gadgets and gizmos! The mug is fantastic right?? And it costed me only four bucks. How cool is that? Your recipe looks amazing. Love the photos and the idea! I have to say, though, your mama taught you wrong. If you make a water/cocoa paste before adding it to the beverage, you will never get lumps. Is it weird that I'm fantasizing about hugging a uuuuuge mug of this to my chest while enjoying every sip? I've been craving legit homemade cocoa like crazy, and this looks like it would satisfy my dire need for chocolate with flying colors. 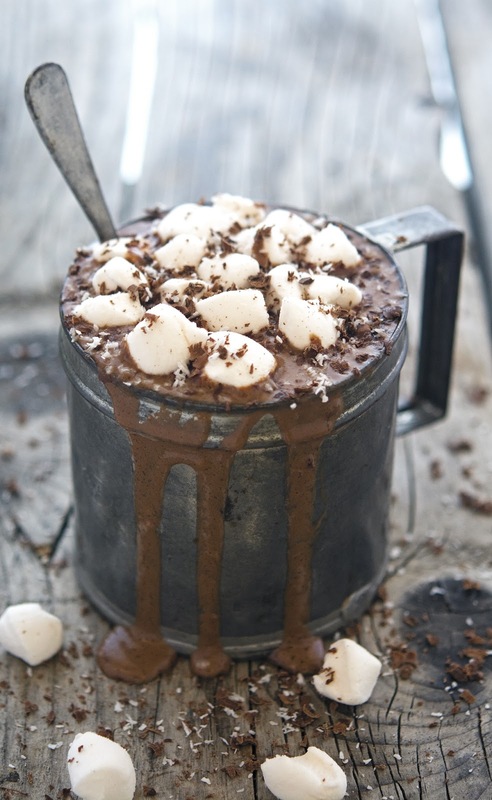 Love the coconut milk, love the dark chocolate, love the drips down the rustic mug..the mallows...le sigh. I need! Wow Mike, talk about decadent..........looks and sounds delicious! Decadent but healthy, not bad right? So yummy!! I made cinnamon coconut cream whip cream to top it with and a heated almond butter drizzle. So good! Thanks for the recipe!